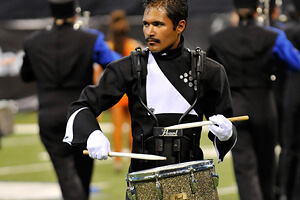 The 2010 Drum Corps International Tour is often remembered for wicked weather hammering drum corps. A number of big competitions were rained out, and the planned opening of the Lucas Oil Stadium roof was axed due to a heat index of over 100 degrees. But the season is also remembered for bringing us some of the most incredible performances of all time. Performances that resulted in the highest averaged Finals score ever of 92.696. 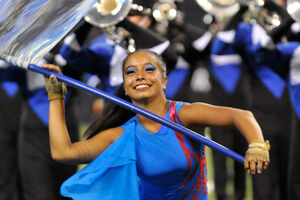 Blue Devils took home their 14th World Championship title that August, ending two back-to-back undefeated seasons with perfect scores in two of the visual captions. After falling from the top-three the year before, the Cavaliers made it back for the 11th time in 12 years, joined by the first-time medalist Bluecoats. The Blue Devils demonstrated that even five decades wasn't enough time for some fans to find comfort in Stan Kenton's most progressive music, and the Cavaliers' "This is my rifle" segment left fans screaming as loud as the amplified trumpet soloists. The character Little Geoffrey stole the show from the Cadets and even had his face plastered on their flags. Phantom Regiment's "spirit guide" beckoned the corps out of darkness and toward the light at the end of the tunnel. Blue Stars earned the highest Finals score ever for an 8th place corps, and the Madison Scouts once again became the Madison Scouts, bringing back memories of the corps' 1975 title run. Blue Knights' 11th place production of "Europa" was based on the late 1800s music of three European composers. The show was all about the music. There was neither storyline nor overlaying visual theme, starting with Georges Bizet's "Farandole" from the 1872 "L'Arlesienne Suite No. 2." A farandole is a "chain dance," where dancers are connected to each other with their hands or arms. It was quite popular in the extreme southeastern part of France, next to the Mediterranean Sea and Italy. The music was written as incidental music to a play, the title loosely translated as "The Girl from Arles." The play was not a success and closed soon after opening. The second suite from the incidental music was arranged for full orchestra by Ernest Guiraud and published in 1879, four years after Bizet's death. "Farandole" was the final of the four movements and became an instant success. Starting quietly with a soft interpretation of the main theme, it took a half-minute until the brass section hit the audience over the head with a grand exclamation of the melody that everyone knows. A trumpet solo accompanied by a snare drum soloist was answered by a mellophone player accompanied by a tenor drummer. The piece built up steam before the entire color guard unveiled orange flags that matched the color of their costumes. These were introduced just prior to a moment of silence highlighted by the brass players tipping their heads during a simple "ding" from the orchestra bells. Two movements from Edward Elgar's "Enigma Variations" were the heart of the show, changing the production's demeanor with a sense of serenity that was highlighted by the color guard changing costumes and flags from orange to blue. An enigma is something considered obscure, difficult to understand or mysterious. The generally known title of the orchestral source material is the commonly used name for Elgar's "Variations on an Original Theme for Orchestra, Op. 36." Consisting of a theme with 14 variations, the work from the last two years of the 1800s is the British composer's best-known large-scale work. The title "W.N." stood for Winifred Norbury, a friend whom Elgar found to be relaxed and laid-back. This segment was used solely as a front ensemble percussion introduction to "Nimrod," the most famous work from the set. The haunting beauty of "Nimrod" has strong emotional connections to the British people. The piece is played at many solemn occasions, including funerals and memorial services. Instead of pushing forward during the climactic hit, the Blue Knights stood still to unleash the final impact, which was the show's most emotional moment. Johnnes Brahms' "Symphony No. 1" was completed in 1876 after a tedious period of 21 years. Colors in the guard costumes and flags turned lime green, with hints of purple, as a percussion mallet-based transition introduced "Movement 4, Adagio." This movement was based on an Alpine shepherd tune originally set to the words, "High on the hill, deep in the dale, I send you a thousand greetings." The symphony, and especially this movement, is often regarded as referencing Beethoven's "Symphony No. 9," "Ode to Joy," from a half-century earlier. The simple, passionately soaring melody of the symphony brought the show to a joyous conclusion and left fans humming the unforgettable tune during the break between corps that followed. For this week only, you can save on the DVD that contains this complete Blue Knights performance, along with all of finalists corps at the 2010 DCI World Championship. Buy the 2010 World Championship DVD set. (Available this week only for 20% off. Regular price: $45.95.) Discount DVD offer ends Monday, Feb. 18 at 8:30 a.m. ET.